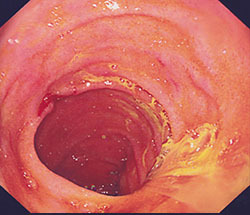 A variety of techniques are available to investigate the large oesophagus, stomach and duodenum but the “gold-standard” remains the OGD. It is the most accurate means by which pathological processes may be identified and offers advantages in that specimens may be removed to allow careful assessment and conditions (such as bleeding ulcers) effectively treated. After a period of dietary restriction usually at home, admission is made to hospital as a day case. A consent form is signed by surgeon and patient. An intravenous cannula is inserted and a sedative/ pain-killer administered. 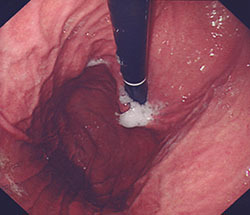 A local anaesthetic spray may also be used to numb the back of the throat for comfort during and after the procedure. A mouth guard is inserted to protect the teeth and the scope is inserted through the mouth and guided into the oesophagus then stomach and duodenum whilst the patient is lying on the left side either relaxed and resting or in a light but easily arousable sleep. The procedure takes about 5 minutes to complete and the results can usually be given and clearly understood within an hour or so of completion. Any biopsies taken will be sent for pathological assessment and results may not be available for several days. Normal diet and activity may be resumed over the next 24 hours although a small amount of abdominal discomfort may remain over this period which usually improves with passing wind. Complications of the procedure include bleeding (less than 1 in 500 cases) and perforation (less than 1 in 2000 cases). Both complications may require hospital admission, observation and/ or emergency surgery.